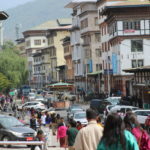 On arrival at Paro Airport and after completing your Visa / Permit formalities you will be received by our representative who will be your tour guide and driver throughout your tour and transfer you to the hotel. Get yourself refreshed and, will begin the first adventure in this magical Kingdom. Visit National Museum of Bhutan the ancient watch tower which houses a collection of art and art facts from all over Bhutan. 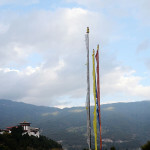 The Museum is housed in the ancient watchtower of the Paro Dzong. Paro Rinpung Dzong which will give you insight on fine Bhutanese architecture. Visit 7th-century Kyichu Lhakhang which was built by Tibetan King Songtsen Gampo in the spread of Buddhism. 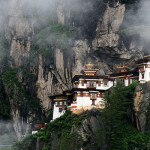 After early breakfast, drive to the base of Tiger’s Nest Monastery and then hike up through the ancient trails shaded by pine trees to Taktsang Monastery, also known as ‘Tiger’s Nest’ built on the face of a sheer 800m rock cliff. The walk up to the viewpoint will take about 1 to 1½ hrs depending on how to fit you are to hike up and from the viewpoint, you will enjoy a spectacular view of the monastery clinging to the side of the cliff. If you wish you can stop for refreshment at the View Point Cafeteria. Then walk further up to the monastery which will take about 1 hour. 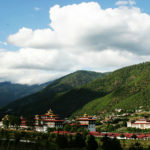 In the afternoon, drive to Thimphu, the capital of Bhutan and visit National Memorial. Chorten, a monument build in 1974 in the memory of Bhutan’s third king H.M Jigme Dorji Wangchuk. You will come across elderly local in circumambulation at the National Memorial Chorten. Visit Tashichho Dzong ‘Fortress of the Glorious Religion’ and appreciated exquisite Bhutanese architecture (after 5 PM) only. 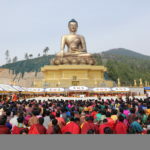 Also, Visit to Buddha point the largest Buddha Stupa of 169ft tall statue and for the stunning evening view of the Thimphu city. Visit Changangkha Lhakhang, a fortress-like a temple perched on a ridge above Thimphu city, Takin Preserve the national animal of Bhutan and Bhutan Postal Museum – to get personalized Bhutanese postage stamps with your photo on them. You can bring along your favorite photo to put on the stamps and put these stamps on your postcard to send to your family and friends. By noon drive to Punakha. En route stop at Dochu La pass at 3,150m above sea level from where you can see a grand view of some of the highest snow-capped peaks in Bhutan. 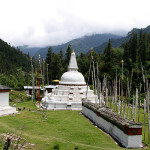 Proceed further and visit 15th-century Fertility Temple “Chimi Lhakhang”. In Punakha, visit the historic Punakha Dzong ‘Palace of Great Bliss’ and appreciate the fine Bhutanese arts and craftsmanship. After breakfast, drive to Yabesa village and hike through rice fields to a beautiful mountain ridge where Khamsum Yuelley Namgyel Temple stands majestically overlooking the fertile valley bellow with glacial fed Mochu River meandering through the valley. A 4-storied temple is a fine example of Bhutanese architecture and artistic traditions stand out on a beautiful ridge above the Punakha valley. Visit Suspension Bridge, the longest of its kind in Bhutan connecting the Dzong with the villages on the other bank of the Pho Chhu (male) river. Afternoon, drive back to Paro. In the evening visit, one of the typical Bhutanese farm houses in Paro where you will be served traditional Bhutanese butter tea, traditional snacks made from maize/rice and locally brewed liquor ‘Ara’. If you are interested, you can enjoy and relax in a traditional hot stone bath (subject to availability). 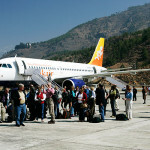 After breakfast, Our representative will transfer you to Paro International Airport for your flight to your onward destinations.